To prepare the syrup: Combine the sugar and water in a small pot and bring to a boil over medium heat. Boil for 5 minutes. Let cool before using. To prepare the picos: In a small pot, heat the margarine together with the milk until it’s completely melted. Turn off the stove and let cool. In a small container, combine the yeast, the 2 teaspoons of sugar and lukewarm water. Let rest a few minutes until the mix has thickened and is bubbly. Incorporate the milk with the melted butter, at room temperature, and stir well. In a mixing bowl, combine 1/2 cup sugar, the eggs and salt. Incorporate the yeast mix and beat on low speed with the paddle attachment until thoroughly mixed. Add the flour and beat for 7 minutes. Cover with aluminum foil and refrigerate overnight. The next day, remove the dough from the refrigerator. Preheat the oven to 375°F. Divide the dough into 8 pieces and squish each piece down with your hands to give it circular shape. Flour the work space and your hands. Sprinkle the grated cheese over the top of each piece of dough along with 1/2 cup of remaining sugar. Fold one half in towards the center, and later the remaining 2 sides to form a triangle. Arrange on a greased baking sheet and let the dough rise for about 1 hour. If you’re in a very hot place, like Nicaragua, 30 minutes will likely be long enough. Bake for 25 minutes or until the picos have expanded and are golden brown. Remove from the oven and transfer to a cooling rack. Immediately drizzle with the syrup and let cool completely. Serve. You can use shredded cotija cheese or any other kind of dry, salty cheese. In Nicaragua, picos are a classic accompaniment for an afternoon cup of coffee or a late morning glass of pinolillo. 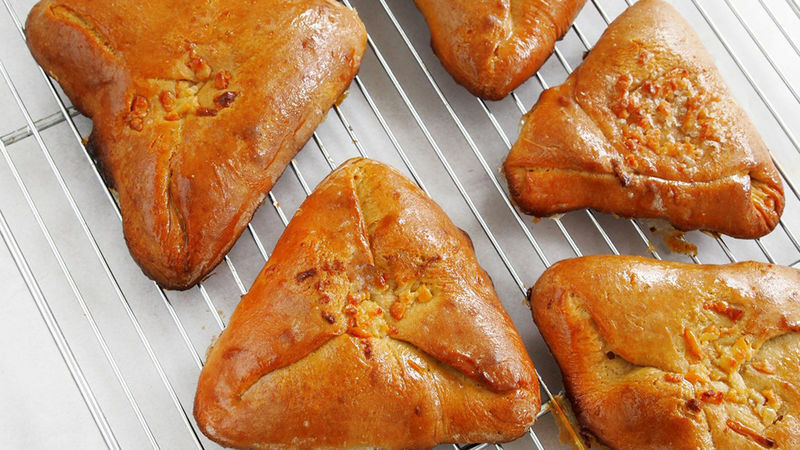 These picos are sweet breads with three points, knead into the shape of a triangle and stuffed with dried, grated cheese and sugar for a beautiful contrast of flavors. The sweetness of the bread and the salty touch of cheese is nothing short of delicious. Sometimes spongy and soft, other times thin and crispy, the thin and crispy variety is a constant temptation for me, and I could eat one after the other. And later some more, because these picos are truly irresistible. Serve them as a snack, you’ll love them!